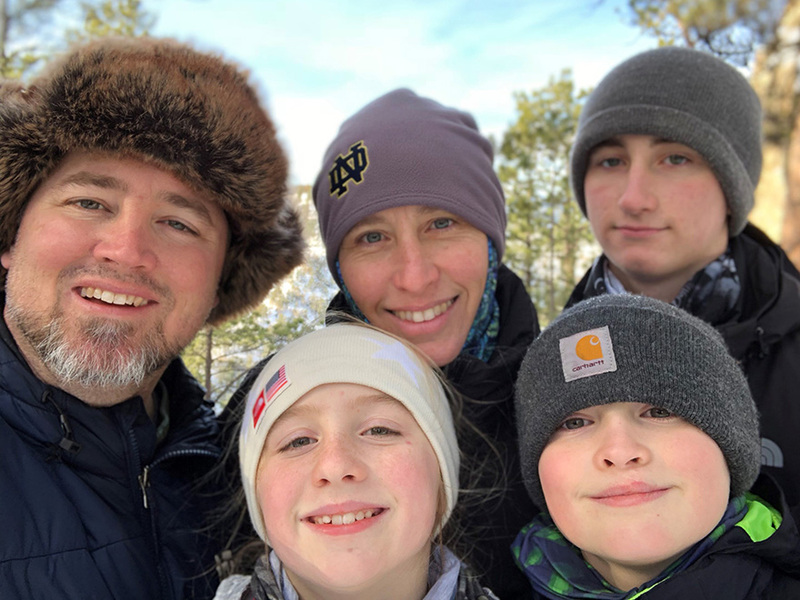 Josh and Stacey Noem have been married for almost 20 years and have three children in middle school and high school. They blog about parenting and their adventures as a family. This is a blog post about “Advent” — note the quotation marks. Advent — real Advent — is full of silent prayer and dog-eared devotional books and thoughtfully-sourced gift buying and wrapping. It’s less TV and more cribbage. It’s candlelight in the long nights. It’s post-card perfect photos on Christmas cards with individualized greetings to connect with friends and family. “Advent,” on the other hand, is what most of us experience in family life, and it’s a far cry from the above. Maybe one day, when the kids are grown and out of the house, Stacey and I will sit and play cribbage by candlelight after spending an evening writing Christmas cards. It ain’t this day, though, lemme tell ya. Just last night, for example, a staff Christmas party, Oscar’s senior band concert, and Simon’s basketball game all began within half an hour of one another. Or how about leaving for work when it’s dark and getting home when it’s dark in time to scarf down dinner before two cars depart to the four winds for dance lessons and parish meetings? Sound familiar? It would be a challenge to implement Advent in normal circumstances, but throw in everything else going on in the weeks between Thanksgiving and Christmas — parties, errands to buy gifts, school programs — and fahgedaboudit. We began with grand intentions — silent prayer every night — but those efforts barely lasted into the second candle. We made it to the parish reconciliation service and have been trying to just keep our heads above water since then. So, our “Advent” this year has been more Survivor than Charlie Brown’s Christmas Special. One remnant from Advent has remained, though, and I’ve found myself clinging to it like a life-preserver: the Advent wreath. That 20 seconds of stillness and song is an anchor. We all gaze at the light and raise our voices and tune our lives to a different longing than the concerns that rush through our days. It’s nothing grand — it’s just a moment, after all — but it keeps me rooted and it reminds me that we’re on a journey, we’re walking together. So, I think that’s a piece of advice I’d like to remember for next year: It will all fall apart — just know that going in. Nice to begin with good intentions, but have a fall-back position when the front lines get overrun. Cling to just one thing — that’s enough. It doesn’t have to be perfect. You don’t have to achieve holiness or enlightenment or perfection in four weeks. You just have to walk together. God will meet you on the road. What a soon-to-be-Dad learned from St. Joseph. Walk with Christ as a family this Lent. Prepare for Christ's birth with your family. Ideas for encouraging generosity and taking the focus off Santa. Visit an elderly family member or someone who does not get out as much and bring your family and the joy of Easter, too. Want a good relationship? Look for these signs. Can Dating Websites Help You Find a Spouse? Is online dating a waste of time if I want to get married? How do I know if I'm ready to marry? A Catholic marriage is more than a contract, it is a sacrament. Marrying someone of another faith? A few things to consider. Marriage is full of surprises - just wait for them. Grow in prayer as a couple and a family. Tips for you and your spouse to peacefully navigate conflict. Live NFP and enrich your marriage. Good marriages can always be made better! The two purposes of marital sexuality: unitive and procreative. Joy and humor are important parts of any relationship. Marriage is a call to holiness. Trusting in God, even in the toughest times, bears fruit. Can bringing young children to Mass go well? Yes. Grow in faith together this Lent. One couple's loving response to a difficult situation. Marriage is free, total, faithful, and fruitful. Want to grow spiritually with your spouse? For Your Marriage is here to support you! If you’re looking for inspiration, resources and thought-provoking content, check out our monthly newsletter.